A Chinese family in Hawaii in the late 19th century. 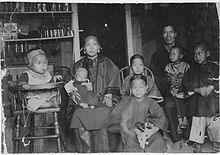 The Chinese kinship system (simplified Chinese: 亲属系统; traditional Chinese: 親屬系統; pinyin: qīn shǔ xì tǒng) is classified as a "Sudanese" or "descriptive" system for the definition of family. Identified by Lewis Henry Morgan in his 1871 work Systems of Consanguinity and Affinity of the Human Family, the Sudanese system is one of the six major kinship systems together with Eskimo, Hawaiian, Iroquois, Crow, and Omaha. The Sudanese/Chinese kinship system is the most complicated of all kinship systems. It maintains a separate designation for almost every one of Ego's kin based on their generation, their lineage, their relative age, and their gender. Maternal and paternal lineages are distinguished. For example, a mother's brother and a father's brother have different terms. The relative age of a sibling relation is considered. For example, a father's younger brother has a different terminology than his older brother. The gender of the relative is distinguished, as in English. The generation from ego is indicated, like in English. Chinese kinship is agnatic, emphasising patrilineality. Kinship terms appeared in the earliest Chinese lexicon, Erya. Chapter Four 釋親 is dedicated to an explanation of kinship and marriage. Another lexicon from late Han Dynasty, Shiming, has a detailed list of forms of address for all relatives. 自子孫 至玄曾 乃九族 人之倫 from son and grandson, on to great-grandson and great-great-grandson. These are the nine agnates, constituting the kinships of man. In Chinese culture where the extended family is still valued, kinship terms have survived well into current usage. Also, since it is taboo to refer to or address a more senior family relation by his or her given name, the kinship term is the only possible term of address. When there are many siblings as in many Post–World War II baby-boom families, the relation is distinguished and addressed according to age or rank. For example, 大 (great/senior/elder) is used in the address for 大姨 (the eldest sister of one's mother); 二姨 for the second eldest sister of one's mother; 三姨 for the third eldest sister of one's mother, etc. In cases where someone is older than his more senior relation, such as an uncle, it is common to address the senior relation with a diminutive suffix. Because some of these terms have no equivalent in foreign languages, they are not easily translated and the descriptiveness is often lost in translation. However, terms such as "Second Uncle" are sometimes used. Translating kinship terms from other languages often presents the problem of ambiguity as there is no equivalent general term such as "aunt". Despite the complexity of the kinship address system (see terminology section below), it is common to simplify it for the sake of familiarity. Some formal kinship terms are not familiar to many people, cumbersome, or not preferred by the addressee. For example, a cousin once removed may at her discretion be referred to as simply a cousin if she is of a similar age to the speaker. The Great Qing Legal Code (《大清律例》) was the last set of Chinese laws where the complete kinship terms were shown. The Qing code not only confirmed the importance of defining kinship relations, but also defined the legal and moral conducts between family relations. Although there was no specific statute in the Qing code to define kinship terms, it specified the mourning attire and ritual appropriate according to the relation between the mourner and the deceased. Kinship relationships also played a crucial role in the administration of justice under the Qing. Penalties were more severe for crimes committed against senior relatives within the family hierarchy. Crimes committed against those outside of the extended family were punished less harshly. Crimes committed by senior family members against their inferiors were least likely to elicit harsh sentences. Among the 47 statutes added in 1740 under Qianlong Emperor, Statute 2 (Charts/Tables of Mourning Attire, 《喪服諸圖》) and Statute 3 (Code of Attire, 《服制》) dealt with mourning attire completed with charts. According to Qing law, one had to observe a period of mourning when a relative died. The closer and more senior the deceased family member, the longer the period of mourning is dictated by law. The mourning period range from three months to three years. During this period, the bereaved had to stay at home, excuse himself from public service, refrain from celebrations of all sorts, and practice abstinence, among other things. The "extermination of nine kindreds" (誅九族) is considered one of the most severe punishments found in traditional Chinese law enforced until the end of Qing. The practice of exterminating the kins had been established since Qin when Emperor Qin Shi Huang (reigned 247 BC–221 BC) declared "Those who criticize the present with that of the past, Zu" (以古非今者族). Zu (族) referred to the "extermination of three kindreds" (三族): father, son and grandson. The extermination was to ensure the elimination of challenges to the throne and political enemies. Emperor Wen of Sui (reigned 581–604) abolished the practice but it was reintroduced by the succeeding Emperor Yang (reigned 604–617). Not only did he bring back the punishment, but he also extended it to the nine kindreds. In the first year of the reign of the Yongle Emperor (Ming dynasty, reigned 1402–1424), the prominent historian Fāng Xìao-rú (方孝孺) committed an offense worthy of the "extermination of nine kindreds" for refusing to write the inaugural address and for insulting the Emperor. He was recorded as saying in defiance to the would-be Emperor: "莫說九族，十族何妨！" ("Never mind nine agnates, go ahead with ten!"). Thus he was granted his wish with an infamous case, perhaps the only one, of "extermination of ten kindreds" (誅十族) in the history of China. In addition to the blood relations from his nine-agnates family hierarchy, his students and peers were added to be the tenth group. Altogether 873 people were said to have been executed. To this day, a three-character term for "death to the entire family" remains a powerful curse in the Cantonese language. A Chinese clan is a patrilineal and patrilocal group of related Chinese people with a common surname sharing a common ancestor. In southern China, clan members could form a village known as an ancestral village. In Hong Kong, clan settlement is exemplified by walled villages. An ancestral village usually features a hall and shrine honouring ancestral clan members. A clan pedigree can be found recording male members of the clan. A married woman is considered part of her husband's clan. Marriage is an important rite signifying the coming together of two clans and the beginning of a new family unit. Marriage has to be permanent and issue is expected.Weddings were central occasions in a family's life. Spouses were chosen carefully by the parents. Marital agreements, especially among the well-to-do, were stipulated with contacts between both families. This practice was continued for centuries and spread throughout the world, and goes on to this day. Divorce on the other hand was nearly impossible. The choices made between the families became so strong that such events as weddings were held on certain days to make sure that things went well. This started to really take off during the Han Dynasty (202BCE-220CE). Polygamy (specifically polygyny) had been practised in Chinese societies for thousands of years. Since the Han Dynasty, Chinese men have been able to legally have only one wife. It was common for privileged Chinese men to have a wife and various concubines, however. For those who could afford a dowry and support a family of multiple concubines and children, polygyny provided a better chance of issuing heirs. The importance of this was apparent in the imperial court, which usually housed hundreds of concubines. Aside from concubinage, having multiple wives with equal status was also accepted prior to the ban on polygamy. In a concubinage situation, the wife, concubines and their children would live in the same household. Wives and concubines would often refer to each other as "sisters". As a concubine was not wedded in a marriage ceremony, she had fewer rights in the household. There was also no inter-clan relation between the man's clan and the concubine's own kin. Polygamy was banned in China in 1930 when the Republic of China government promulgated Civil Code (Part IV) where Section 985 states "A person who has a spouse may not contract another marriage. A person shall not marry with two or more persons simultaneously.". This is still in effect today in the territories under effective administration of the Republic of China including Taiwan and Kinmen and Matsu. After the establishment of the People's Republic of China by the Chinese Communists on the mainland, this banning was reaffirmed in the passage of the Marriage Code of 1950. In Hong Kong, new polygamous marriages were no longer legally allowed after 1971 with the passage of the Marriage Act. Due to this, incidents of extramarital affairs are rising. Some men have even established a family with their mistresses and children kept secret from their wives. There is a phenomenon of cross-border polygyny usually involving Hong Kong men and their mistresses living in Mainland China. With modern Chinese governments advocating smaller families through family planning campaigns and policy-making, large extended families may be a thing of the past. The People's Republic of China introduced its One-child policy in 1979, and The Family Planning Association of Hong Kong began its "Two is enough!" (兩個就夠哂數!) campaign in the 1970s. Contrasted with the large extended families created during the pre-war and baby-boom years, average modern Chinese families now have many fewer children. As of 2006, the fertility rates in Hong Kong and Macau ranked among the lowest two in the world. Hong Kong, ranked the lowest in the world, was the only territory with less than one child born per woman on the average. Both Mainland China and Taiwan were ranked well below the world average. Similarly, the birth rates in Hong Kong and Macau ranked among the lowest three in the world. Both Mainland China and Taiwan were ranked below the median. A product of rising divorce rates in Chinese societies is the breakdown of the traditionally close-knit kinship relation. On the other hand, remarriage could provide more than two sets of paternal or maternal relatives. The "nine grades of relations" (九族) is an important concept when it comes to application of laws and observing rituals. Since the Han Dynasty, there have been two separate interpretations of what is defined by the nine grades. Each interpretation is based on societal and political needs as the ruler of the day see fit. The "older" interpretation ("古文說") defined the nine grades of relations strictly in the paternal line. That is, nine generations from great-great-grandfather down to great-great-grandchildren. This interpretation was officially recognised after Tang and Song dynasties. By Ming and Qing dynasties, laws have defined the patrilineality of the nine kindreds. This interpretation was cited in Part III Chapter 2 of Lewis Henry Morgan's 1877 book Ancient Societies. The "contemporary" interpretation ("今文說") defines the nine grades of relations to be four generations from the paternal line, three from the maternal line, and two from the wife's. Historically, this definition has been used during award, punishment and family annihilation. Yet another interpretation suggests that "nine" is actually an arbitrary number as nine is considered a large number in Chinese culture. As such, it means anyone and everyone related is to be executed in the context of family annihilation. The five degrees of mourning attire (五服) define not only the proper attire, but also the proper mourning ritual one should observe when a relative has died. Appearing in writings as early as the Rites of Zhou, mourning rituals developed over the years. By the time of the Qing dynasty, it was set down in law that there were five degrees, or grades of mourning according to the relationship one has with the deceased. The closer a person is related to the deceased, the higher the degree of mourning that is observed. A married female belongs to her husband's clan and observes a similar but lower degree of mourning than her husband. She would observe mourning for a small portion of the members from her own clan. A married man would observe mourning for an even smaller number of relatives of his in-laws. In a concubinage situation, a concubine was only required to mourn for her husband, his wife, his parents, and all his children including her own, whereas a wife was required to mourn for almost all of her husband's near relatives. In addition, there was no requirement to mourn the death of a concubine except by the man's children. Since the end of feudal China, the rituals of the five degrees of mourning have largely given way to simpler and less elaborate observance. Conventionally, clans adopted the five degrees of mourning according to unwritten definitions that determines the difference between close and distant relatives. As such, marriage between relatives that were covered within the five degrees of mourning was considered taboo and immoral. These definitions, unlike the mourning ritual, are still applicable in determining whether a marriage is acceptable, albeit fewer people are familiar with the mourning rituals themselves. According to these definitions, many relatives considered "distant" in Western cultures are considered close in Chinese culture. This section is a work in progress. The paragraph below suggests that, aside from Standard Chinese, there are Mandarin and Cantonese usages. In reality, "Mandarin" and "Yue Chinese" are both varieties/branches of Chinese (not including other varieties of Chinese) and each variety has various dialects based on the region. Also, a person may use terminology from a region but pronounce the term with the regional pronunciation, a different regional pronunciation, or in Putonghua, which may be the case when a person has family members from different parts of China. This section covers members and their spouses in the immediate and extended family that is commonly found in the first nine corner cells on the table of consanguinity or cousin chart (from ego to grandparents on the rows and columns). The terms are listed in Standard Chinese, regional and dialectal usages are listed in the corresponding row. The degrees of mourning attire are included as an indication of how close the relation is to ego and what level of respect is expected. "1" being the highest; "5" being the lowest. "0" means they are not within the definition of the five degrees of mourning. Some of these are common relations and are included for completeness. The degrees of mourning indicated in the table are based on ego as an unmarried member of the family. 祖 (zǔ) - prefix for relations two generations removed senior of ego, i.e. : grandparents (祖父母), also a general prefix for relations two or more generations senior of ego. 孫 (SC: 孙) (sūn) - prefix for relations two generations removed junior of ego, i.e. : grandchildren (孫), also a general prefix for relations two or more generations junior of ego. Where they differ, the Simplified Chinese character is presented first, followed by the Traditional Chinese character in parentheses. This section covers members and their spouses found beyond the first nine corner cells on the table of consanguinity or cousin chart. Although some of the relations seem distant, they are considered close relatives and it is common for Chinese families to have regular contact with these members. all other grandchildren of father's sibling 表姪兒女 "
grandchildren of mother's sibling 表甥兒女 "
son of paternal grandfather's brother who is older than ego's father 堂伯 "
son of paternal grandfather's brother who is younger than ego's father 堂叔 "
daughter of paternal grandfather's brother 堂姑 "
son of maternal grandfather's brother 堂舅 "
daughter of maternal grandfather's brother 堂姨 "
son of paternal grandfather's sister who is older than ego's father 表伯 "
son of paternal grandmother's sibling who is older than ego's father 表伯 "
son of paternal grandfather's sister who is younger than ego's father 表叔 "
son of paternal grandmother's sibling who is younger than ego's father 表叔 "
daughter of paternal grandfather's sister 表姑 "
daughter of paternal grandmother's sibling 表姑 "
son of maternal grandfather's sister 表舅 "
son of maternal grandmother's sibling 表舅 "
daughter of maternal grandfather's sister 表姨 "
daughter of maternal grandmother's sibling 表姨 "
son of paternal (maternal) great-grandfather's brother who is younger than ego's grandfather (外)族叔祖父 "
daughter of paternal great-grandfather's brother (外)族祖姑 "
all other great-grandchildren of parent's sibling 表姪孫兒女 "
maternal grandson of paternal grandfather's brother older than ego 隔代表兄 "
maternal grandson of paternal grandfather's brother younger than ego 隔代表弟 "
maternal granddaughter of paternal grandfather's brother older than ego 隔代表姐 "
maternal granddaughter of paternal grandfather's sister older than ego 隔代表妹 "
paternal great-granddaughter of paternal grandfather's brother 堂侄女 "
Other than some of the relations mentioned in the previous sections that are not covered under the five degrees of mourning attire, the following are kin that are also considered distant. The following familial relationship suggests partial or no consanguinity. Most of them are not a modern phenomenon, however. In fact, polygamy (specifically polygyny) was widely accepted in pre-republican China. ^ Yang, Rae (1998), Spider Eaters: A Memoir, University of California Press, p. 46, ISBN 0-520-21598-2, retrieved 2009-07-14, The letter became evidence of Second Uncle's yearning for the Nationalists to come back. ^ Wiesner-Hanks. Gender In History. Wiley-Blackwell. p. 30. Wolf, Arthur P. and Chieh-shan Huang. 1985. Marriage and Adoption in China, 1845-1945. Stanford University Press.